This week we started to ease out of the heavier wintery meals, and tried to ease into the next eating season. Cheeseburgers! With homemade buns! 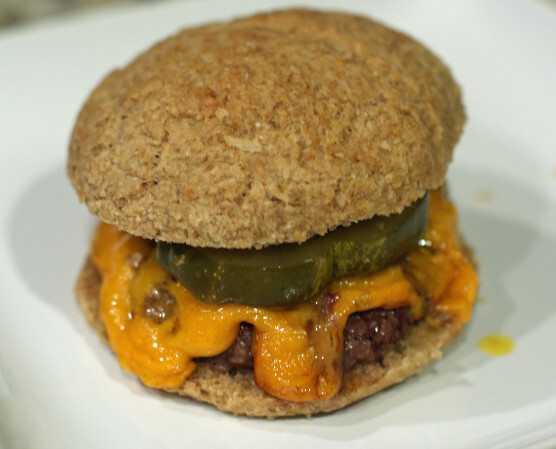 The buns are easy and add a whole new flavor dimension to your burgers – nothing like the mass-produced store buns. In a medium bowl, combine the water, sugar and yeast, and stir to dissolve. In a larger bowl, mix the flour and salt. Add the milk, egg, and oil to the yeast mixture and stir. Add the liquid ingredients to the flour, and stir to combine. Dump onto a counter or other flat, clean surface and knead for about 10 minutes, adding a little flour if the dough is too sticky.Place in a bowl and let rise in a warm place for about an hour. After rising, cut the dough into 8 equal chunks, then roll into balls, flatten just slightly, and place onto a baking sheet. Let rise for another 20 – 30 minutes, then bake at 375 F for about 15 minutes. Not all the ingredients were local for the buns (oil and yeast). The cheeseburgers were just patties made from our ground beef, topped with some smoked Cheddar from the Middlefield Cheese Co-op, and when we served them, I put a couple homemade pickles on top. No tomatoes yet, but they were still pretty darn good burgers!